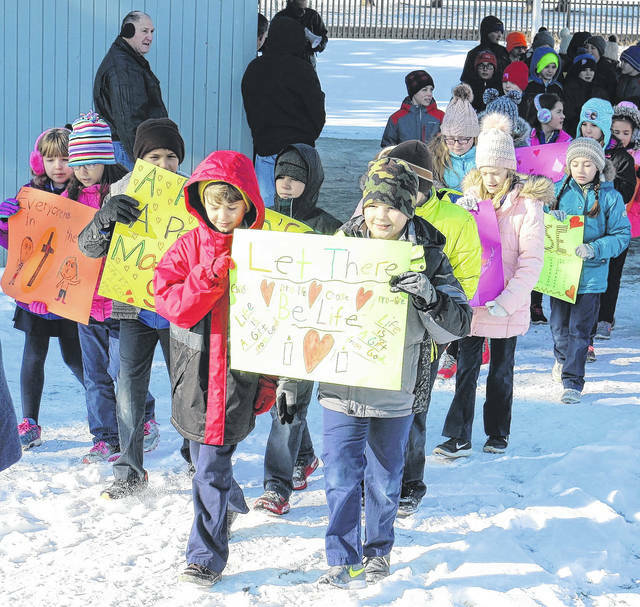 Students from St. Mary’s Catholic School in Van Wert participated in a Mini-March for Life, going from Fountain Park to the Knights of Columbus Hall. VAN WERT — While thousands of people gathered in Washington D.C. Friday to protest the U.S. Supreme Court decision to allow abortion, a much smaller group gathered in Van Wert to show their support for the pro-life movement. “The theme this year is ‘Love Saves Lives,” said Mini March spokeswoman Diana Pollock. “The main goal is to bring attention to the fact that almost 60 million children have been aborted since Roe versus Wade went into effect, and it is a time for all of the churches and the interdenominational groups here in town and across the world to come together as a united front to show the fact that abortion is so wrong. “We stand for life, complete life from the minute of conception until natural death,” P0llock said. The group, including children from St. Mary’s Catholic Church School marched from Fountain Park in downtown Van Wert to the Knights of Columbus Hall on Woodland Avenue. Since the 1973 decision, many religious and political groups have tried to chip away at that reproductive right, through stricter regulations. With Republican Donald Trump in the White House, the marchers are optimistic things could change. “I think a lot has changed. If you look at the actual March for Life and the groups that are now involved and the youth. It is now a youth movement so the attention has been brought forward. This year is the first year a President of the United States has actually addressed the march. There are thousands and thousands upon thousands that are in Washington D.C. but not only Washington D.C., major cities all over the whole country and across the world. So I think a lot has changed. Sixty million seems like an extremely large number of abortions but if you look at how many would have been lost had we not started this movement it could have been way beyond that,” she said. Pollock, and others in the pro-life movement, would prefer women carry children to term and let the child be adopted. “For every one child that is adopted there are seven killed and we have lots and lots of people who want to adopt children and there are all different types of organizations and churches and groups that are here to support life,” she said.